All members of the Russian expedition to K2 have successfully made it to Islamabad. There was 3 flights from base camp at K2 to evacuate all of the members. All the gear was taken also. They initially went to Skardu. Vitaly Gorelik’s body was taken to Skardu’s hospital. The 2011/12 Russian expedition to K2 has been cancelled after the death of one of their climbers. Vitaly Gorelik died after suffering frostbite. The frostbite was on both hands. He had been climbing up to 7000m from 28th January to the 31st delivering gear. A helicopter was called for Gorelik but it could not arrive because of the poor weather around K2. They await a helicopter to transport the body from base camp. All of the other members of the expedition are now at base camp. Another Russian climber has frostbite. Vitaly Gorelik has frostbite of his hands. A helicopter has been called, but due to the bad weather he has been unable to be airlifted out. Vladimir Belous had flown home several days ago with frostbite to his hands. At the same time though the expedition has made good progress up the Cesen route. Iljas Tukhvatullin, Andrew Mariev and Vadim Popovich made it to 7050m via fixed ropes. Then they fixed some ropes to 7200m. They were unable to setup camp because they would have needed to cut into the steep slope which they weren’t able to this time. Below shows their progress up the Cesen route. 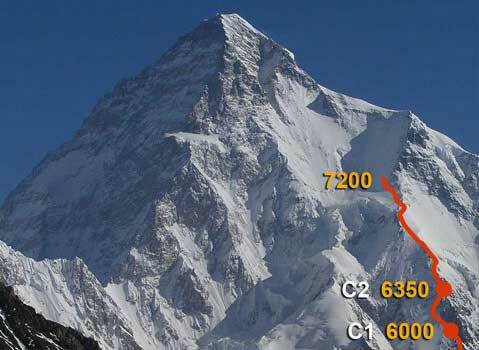 Russian climbers have been making progress up the Cesen route on K2. Iljas Tukhvatullin, Andrew Mariev and Vadim Popovich have been climbing since 25th January. The duo Alex Bolotov and Eugeny Vinogradsky have been doing similar since January 26. A group of Russian climbers including Nickolay Totmjanin Valery Shamalo and Vitaly Gorelik started climbing on the 28th January from base camp. They reached camp 2 the next day. They were expected to push ahead above 7000m and make a place for camp 3. Later in the week is expected to be worsening conditions with the weather. You are currently browsing the K2 Blog blog archives for February, 2012.